In each of the five Ganga River states, a maximum of five villages from the riverside will form a ‘Cluster’. Each cluster will have a leader who will be chosen by WII in consultation with other members from the cadre. A Block Cluster Leader will lead the entire cluster in a particular block. 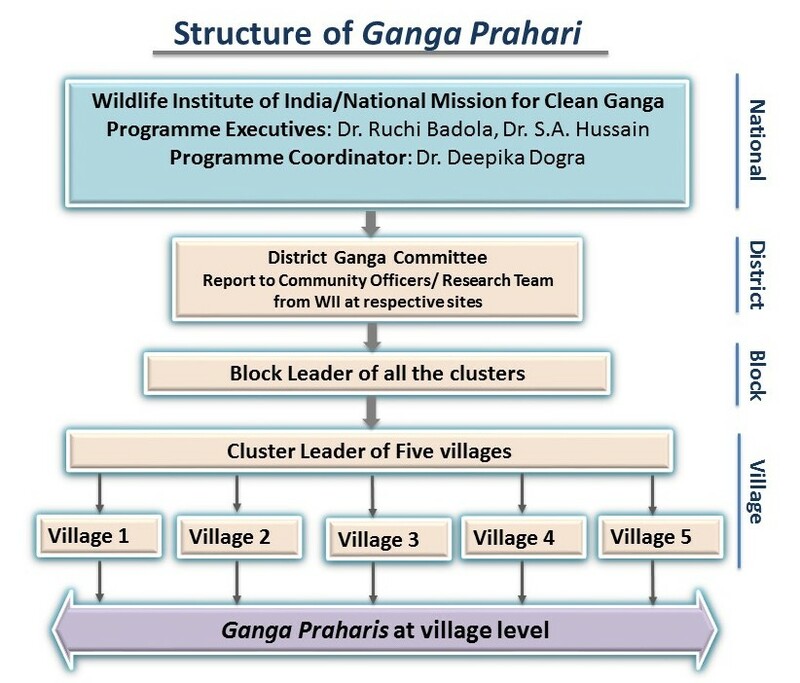 The Block Cluster Leader and Cluster Leader will be selected from among the Ganga Prahari of these villages, on a three months rotational bases. Each Cluster Leader, with the support of Ganga Praharis , will conduct minimum ten relevant activities in a months time. These activities will be proposed to NMCG-WII executives for approval. All the necessary logistics support during those activities shall be provided by WII through the NMCG-WII project. The Cluster Leader will be paid a token amount as honorarium for each of the activity. The Cluster Leader will be evaluated on the basis of their performance in the field and the best performing Cluster Leader will be awarded, to encourage the Ganga Praharis.